(16/88) TRENTON – The U.S. Fish and Wildlife Service has awarded the Department of Environmental Protection an $850,000 grant under the federal Endangered Species Act Grants Program, Commissioner Bob Martin announced today. The Cooperative Endangered Species Conservation Fund (CESCF) Recovery Land Acquisition grant for New Jersey will go toward the future acquisition of hundreds of key acres of habitat for the bog turtle, which is found predominately in the northern half of New Jersey. New Jersey is one of 20 states to receive funding to support projects that conserve at-risk species and their habitats. 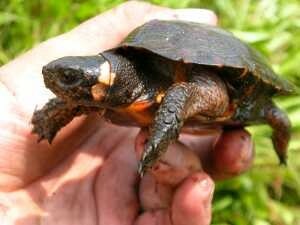 The bog turtle is native only to the eastern United States and is found in the northern half of New Jersey. The species, considered threatened at the federal level and endangered at the state level, congregates in small colonies often of fewer than 20 individuals. They prefer calcareous wetlands (areas containing lime), including meadows, bogs, marshes, and spring seeps, that have both wet and dry regions. CESCF funding is provided through three competitive grant programs: the Habitat Conservation Planning Assistance Grants Program, which provides funds to support the development of Habitat Conservation Plans (HCPs) that protect habitat for listed species; the Recovery Land Acquisition Grants Program, which provides funds for the acquisition of habitat in support of approved and draft species recovery plans; and the HCP Land Acquisition Grants Program, which provides funds to acquire habitat for listed species associated with approved HCPs. The grants are funded in part by the Land and Water Conservation Fund, which was established by Congress in 1965. The fund promotes access to outdoor recreation resources for present and future generations by providing funding to federal, state and local governments to purchase land, water and wetlands for the benefit of all Americans. For the past 51 years, the fund has supported more than 40,000 conservation and outdoor recreation projects nationwide.